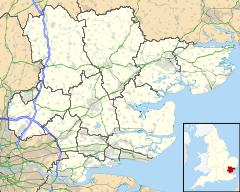 Childerditch is a settlement and former parish (abolished 1934) in the borough of Brentwood, Essex. It forms part of the Warley borough council ward. Childerditch church is a landmark on a hilltop to the north of the A127 road. The church is dedicated to All Saints and St Faith. It was constructed in 1869, to the designs of D. C. Nicholls and Fred Johnstone. ^ "Childerditch AP/CP through time | Census tables with data for the Parish-level Unit". visionofbritain.org.uk. Retrieved 2017-08-28. ^ Bettley & Pevsner 2007, p. 232. Bettley, John; Pevsner, Nikolaus (2007). Essex. The Buildings Of England. Yale University Press. ISBN 978-0-300-11614-4.